Completely renovated in 2017, Hôtel Le Louis Versailles Château, MGallery by Sofitel is now a 4-star hotel inviting travelers to immerse themselves in the splendor of the Court of Versailles. The hotel’s resolutely contemporary design, draws its inspiration directly from the neighboring Palace of Versailles. Situated just 200 meters from the Palace of Versailles and its Gardens, Hôtel Le Louis Versailles Château enjoys a prime location. It is the ideal starting point from which to explore the most beautiful cultural and historic sites of the Royal City, such as the Royal Opera, the Centre de Musique Baroque and the Théâtre Montansier. Versailles is an international tourist destination boasting an exceptional heritage. It was conceived four centuries ago at the behest of King Louis XIV, and constructed by Jules Hardouin-Mansart and André Le Nôtre, respectively the principal architect and principal gardener to the King. The result is an authentic and welcoming city with nature ever present, an atmosphere that has been reproduced at Hotel Le Louis Versailles Château. Thanks to its proximity to the city’s two main railway stations, Paris is just a 20-minute journey away. Le Louis Versailles Château sits on the site of a former equestrian arena used by the Artillery, built by the War Ministry of Louis-Napoléon III in 1854. The impressive gateway from this period remains unchanged today and has been designated as an historic monument. Once through the gates, guests will discover a building of classical architecture of just four floors, since in Versailles, no building can be higher than the King’s chamber in the Palace. Inside the hotel, guests enter a truly timeless setting. The redesign of the hotel was entrusted to the Russian architectural firm, Sundukovy Sisters. In this history-steeped location, the two sisters decided to showcase the contrasting eras through decor that blends contemporary elegance with classical refinement. The design of the space reflects the harmony that exists between the Architect and Nature, a powerful theme running through the hotel decor, echoing the gardens of the Château. All the elements and materials have been carefully selected to evoke Versailles and every space has been reinterpreted with a contemporary feel. Light reigns supreme in the architecture of the hotel: it shapes every area and imbues each of the spaces with a unique ambience. From the lights illuminating the facade at night to the impressive central glass roof, the majestic chandelier in the hotel bar and the mirrored sconces that disperse light throughout; everything recalls the “Sun King”. In the 152 rooms, which include 7 suites, the past interacts with the present to create a plush and restful ambience: antique mirrors, conical lamps that recall the trees in the royal gardens, classical LED chandeliers, carpets inspired by herringbone parquet flooring and elegant white marble bathrooms. In L’Alcôve, the hotel’s bar-restaurant, guests and locals are immersed in the pure essence of Versailles through numerous references to the history of the city and its Palace, such as the shades of dark green evoking the Gardens of Versailles, the stylized wallpaper reminiscent of the nearby gardens’ Orangerie and the statue of the Lion, the emblem of royal power. Here, the Head Chef gives top billing to seasonal produce and offers classic dishes, once again reinterpreted in the most contemporary way. The bar becomes a truly lively space where guests and the curious can rub shoulders, enjoying a range of evocatively-named cocktails and mocktails. They include the signature cocktail Marie Antoinette, Elle et Louis as well as Le Roi Soleil. 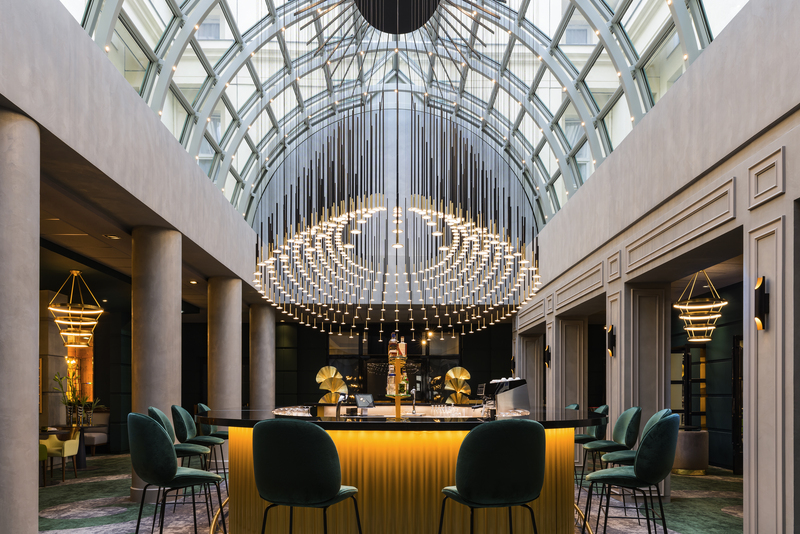 The centerpiece of the bar is the prodigious Blackbody-designed chandelier which takes center stage beneath the vast glass roof and creates a feeling of exclusive intimacy. Lastly, the fitness center and the nine modular meeting and conference rooms at Hôtel Le Louis Versailles Château have also been completely refurbished. With Hôtel Le Louis Versailles Château, MGallery is expanding its collection of boutique hotels, which already includes 90 locations throughout the world. The brand also has 30 projects currently under development which, over the coming months, will include the MGallery Doha in Qatar, the MGallery Dubai in the United Arab Emirates, the MGallery Livorno in Italy and the MGallery Istanbul in Turkey. MGallery is AccorHotels’ collection of inimitably enchanting, unique boutique hotels to discover the world and beyond. MGallery by Sofitel has 90 unique and fascinating addresses in 24 countries around the world, all of which are havens for those who relish off-the-beaten-track experiences. Each address is remarkable for its singular personality and is deep-rooted in local history. AccorHotels is a world-leading travel & lifestyle group and digital innovator offering unique experiences in more than 4,200 hotels, resorts and residences, as well as in over 10,000 of the finest private homes around the globe.